Marvel dropped a long batch of Avengers:Endgame ‘Avenge The Fallen’ posters yesterday which featured both survivors of Thanos’ snap-in Infinity War and some of the fallen too, including those who got dusted in the universe ending event. While some posters came as a little surprising, like a poster hinting at Shuri’s dark fate which has left fans to wonder if it’s hinting at the survival of One fallen hero. The posters look pretty divided. The ones who survived the snap are in colour while the ones which are dead are in black and white. 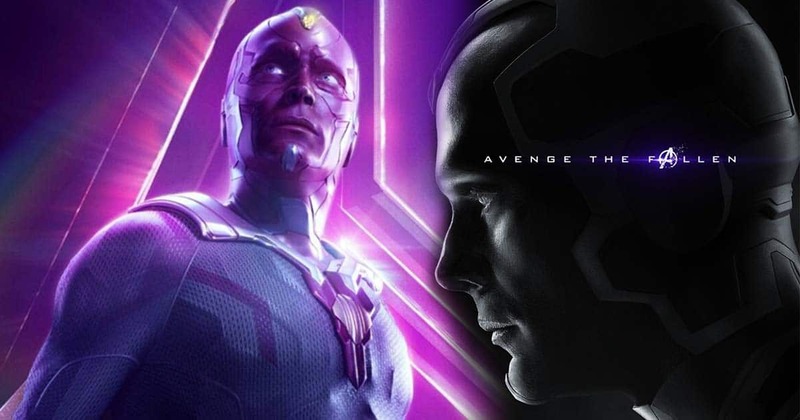 It’s enough to have fans, including Digital Artist BossLogic, wonder if the hint of colour means that Vision managed to survive. As many fans would remember, Vision wasn’t snapped out of existence in Avengers: Infinity War. Since he wasn’t actually a living being, Thanos’ snap wouldn’t have affected him. Instead, Thanos ripped out the Mind Stone off Vision that ultimately ended him. But before that and even prior to Scarlet Witch trying to prevent Thanos from getting the stone by ending it herself. Shuri had been trying to separate Mind Stone from Vision. While she ran outline to do it, it’s possible that she managed to process a version of him. How Can we get Vision back? If this happens to be the case, it’s possible to get Vision back, although he likely won’t be the same as before. And actually, there is some precedence for that kind of scenario from the Marvel Comics. The “Vision Quest” storyline sees Vision getting abducted by time traveller Immortus who ends up dismantling him. The Avengers managed to recover his parts and build him again but without Simon Williams’ brain matrix to be used as a matrix for Vision’s emotions. A hero was recreated which was emotionless and pretty far from his usual self. Obviously, in case, Vision is still alive in Shuri’s computer, getting him back would be a little easier.